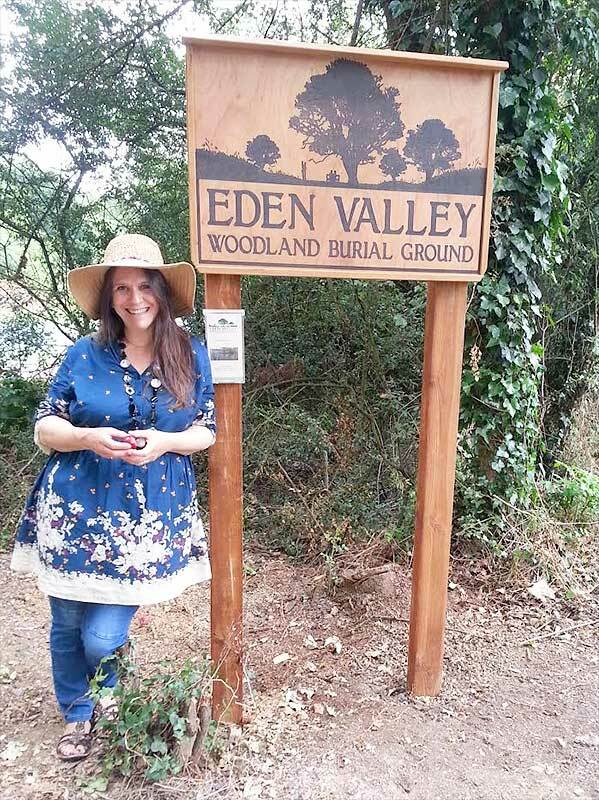 Eden Valley Woodland Burial Ground – ideally situated and easily accessible. Eden Valley Burial Ground is situated on the Kent, Surrey border to the north west of the small market town of Edenbridge. We are just a 12 minute drive south from Junction 6 of the M25, and just 1 hour 10 minutes from south central London, avoiding rush hours. As part of our commitment to environmental issues we wish to encourage you to use public transport when visiting the site and also would like you to suggest group travel to mourners when making funeral arrangements. A minibus or coach from a central collection point to a funeral can become an important and positive part of the mourners’ experience, giving additional time to chat and reminisce. Journey times shown are approximate. Edenbridge is served by two railway stations on different lines connecting Tonbridge to London and Uckfield to London. Trains runs three times an hour to Edenbridge or Edenbridge Town station direct from London Bridge. The burial ground is approximately a 20 minute walk from Edenbridge Town station and a 25 minute walk from Edenbridge station. Direct buses run to Edenbridge from a large number of local towns including Tunbridge Wells, Sevenoaks, Hever, Oxted, Crawley, Lingfield and East Grinstead however they do not run on all days. PLEASE NOTE: This train may split into three before reaching Edenbridge so please ensure you listen for announcements. Turn right at the end of the pathway along Station Road (not under the bridge). You will go past EASISTORE on the right, Fircroft Way on the left then a petrol station on the right. At the first roundabout carry straight on, signposted Edenbridge. Keep going straight, passing the Eden Centre on your left and Four Elms Road. Pass under a railway bridge. The Leisure Centre will be on your right, continue past this and past the traffic lights, continuing forward up the hill alongside the park. At the next set of traffic lights turn right into Stangrove Road. Follow this road to the end where it meets Crouch House Road. Turn right signposted ‘Golf Club’. Follow this road all the way to the Cemetery passing the following roads on the right – Pine Grove, Stanbridge Road and Orchard Drive. The path will continue down a hill, past Greshams Way on your right and you should see Kent and Surrey Golf and Country Club on the left. This is where the cemetery office is located. To get to the Woodland Burial Ground continue past the golf club, under the railway bridge and the cemetery is the first gateway on the left. PLEASE NOTE: Edenbridge town has a short platform so please ensure you are at the front end of the train to exit. There is no disabled access on one side of the platform. Visitors on the London train will need to cross under the underpass when arriving at Edenbridge Station. Exit the station and follow Station Approach to the end passing Grange Close on the left. You will see a Scout Hut directly in front of you. Turn right on to Station Road and walk down to the main road opposite Eden Leisure Centre. Cross over the road and turn left up the hill. At the next set of traffic lights turn right into Stangrove Road. Follow this road to the end where it meets Crouch House Road. Turn right signposted ‘Golf Club’. Follow this road all the way to the Cemetery passing the following roads on the right – Pine Grove, Stanbridge Road and Orchard Drive. From central London pick up the A3 then the A23 Brixton rd at Kennington. South of Croydon pick up the A22 at Purley. Pass under the M25 at Junction 6 and take the first left onto the A25 direction Oxted. Follow the A25 eastbound for 3 miles, passing Oxted, go under the viaduct and pass Limpsfield. Turn right at the traffic lights on the hill, into Wolfs Row, signed Hurst Green and Lingfield. Follow this road for 2.6 miles, ignore first left turn to Edenbridge. Go straight on. Pass under railway bridge with traffic lights, carry straight on, passing heavily wooded areas. Take left signed Crockham Hill, passing more heavily wooded land. In one mile you go over a narrow, angled railway bridge immediately after this take another left turn signed to Edenbridge and Marlpit Hill. Bend right into Little Browns Lane passing Gardiner Business Park on the right. After a sharp right hand bend you will find Eden Valley Woodland Burial Ground Car park on the right before a railway bridge. If you are attending a pre burial ceremony at the golf club or meeting staff at our office, the golf club is the next entrance on the right after the bridge. Exit Junction 6, A22, direction Eastbourne but turn left at the first roundabout direction Oxted A25. Follow A25 eastbound for 3 miles, passing Oxted, go under the viaduct and pass Limpsfield. Turn right at the traffic lights on the hill, into Wolfs Row, signed Hurst Green and Lingfield. Follow this road for 2.6 miles, ignore first left turn signed to Edenbridge. Continue straight on. Pass under railway bridge with traffic lights, carry straight on, passing heavily wooded areas. In one mile you go over a narrow, angled railway bridge immediately after this take another left signed to Edenbridge and Marlpit Hill. Take the A2026 down through Crockham Hill. On entering Edenbridge town having gone under two railway bridges, follow signs for through traffic at the lights. At the next set of lights turn right into Stangrove Road. At the end of this road turn right into Crouch House Road. Get on to the B2027. Follow through Leigh, Bough Beech and turn left at Four Elms still on the B2027 into Edenbridge. At the end of the road turn left towards the town go under the railway bridge and at the traffic lights follow the signs for ‘through traffic’. At the next lights turn right in to Stangrove Road. At the end of Stangrove Road turn right, you are now in Crouch House Road. The golf club and burial site are on the left once you are past all the houses. They are either side of the railway bridge. Our office is in the golf club before the railway bridge, the burial ground is after the bridge. Take the A264 to its intersection with the A2026 and turn north following the A2026 towards Edenbridge. As you get into the town take the left exit at the little roundabout, signed ‘through traffic’ (this is Mont St Aignan Way). Waitrose is on your right. Immediately on your right is a little village green. Turn right here into Crouch House Road. The Golf Club and Burial Ground are on the left once you have gone past the houses, about 0.7 miles out of town. Our office is in the golf club before the railway bridge, the burial ground is after the bridge. Take the Haxted Road towards Edenbridge. On entering the town look carefully for Crouch House Rd on the left, there is a little village green at its Junction. If you get to the traffic lights at the end of the road you have just missed it (never mind) just turn left and then left again into Stangrove Road, this will bring you onto Crouch House Road. Follow Crouch House Road and signs for the golf club. The Golf Club and Burial Ground are on the left once you have gone past the houses, about 0.7 of a mile out of town. Our office is in the golf club before the railway bridge, the burial ground is after the bridge.